To the excitement of many techno fans on island, Eargasm is back! This outdoor event will be located at Toguchi Beach — also known as Devil’s Cove — and will be held on Saturday, July 7 from sunset (7:00 p.m.) to noon (12:00 p.m.) the next day. Where last year’s Eargasm was focused more towards techno in a broad sense, this year’s event is geared entirely towards goa trance, the deep, dark side of techno. The first Eargasm was held in May 2000, and though the party organizers were hoping for a good turnout, they were not expecting the success they had. “Our intention was just to throw a good party,” says Ski, one of Eargasm’s organizers and DJs. “We weren’t expecting such a turnout, but we were definitely happy with it.” According to Ski, the seed that became Eargasm was planted when he and a few friends were at a small party at Toguchi Beach. The small crew of individuals was inspired to throw a party of their own and immediately began concocting plans, gave the party its name, and followed through with every detail necessary to turn vision into reality. As a result, the first Eargasm went down in history as one of the best techno events this island has seen. Tickets are currently being sold at Pulse Night Club, Sam Goody, and Freak Show Record Shop for ¥1,500 or $15 in advance, or you can purchase them at the gate for ¥2,000 or $20. You can also purchase them from Ski by calling 090-1944-9971 (English only) or from Mika by calling 090-3141-1133 (Japanese only). 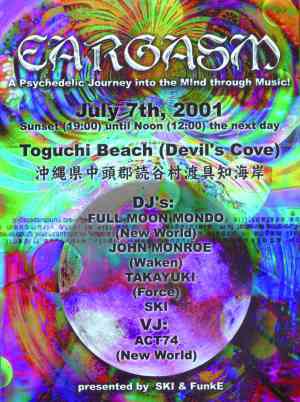 For driving directions and other information about Eargasm, please check out Okinawa’s techno event website at Groove Seeker.